We interrupt the hockey season with some professional box lacrosse featuring the Syracuse Stingers. The Stingers had many of the players from the Onondaga Redhawks team I have photographed over the last two years. The game was an exhibition to gauge interest in bringing back a pro team to Syracuse. The last team played back in 2000. The game was played in the Onondaga County War Memorial the night after a Syracuse Crunch hockey game. The ice was covered with a green colored turf and I took advantage of a hole in the glass to get clear shots of the fast and high flying action of box lacrosse. 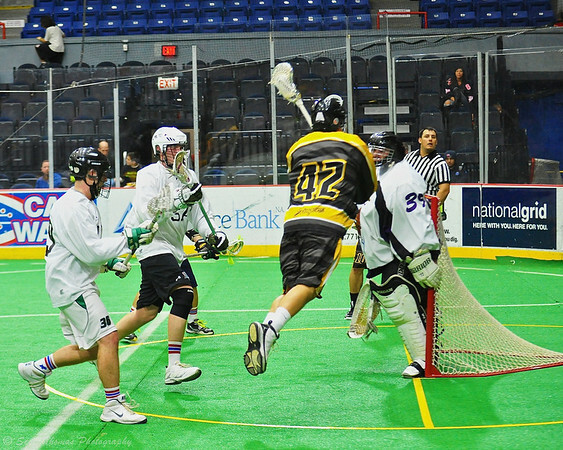 Syracuse Stingers Gewas Schindler (42) launches himself for a shot against the NYC Lax All-Stars at the Onondaga County War Memorial in Syracuse, New York on Thursday, February 21, 2013. Nikon D700/70-200VR, 1/640s, f/2.8, ISO 4000, EV +1.0, 70mm focal length, cropped. The NYC Lax All-Stars were a mix of players from Central New York and Long Island which were no match for the well prepared Stingers team who scored fast and often. Syracuse Stingers Dave Wood (3) splits the NYC Lax All-Stars defense at the Onondaga County War Memorial in Syracuse, New York on Thursday, February 21, 2013. Nikon D700/70-200VR, 1/640s, f/2.8, ISO 3600, EV +1.0, 86mm focal length, cropped. 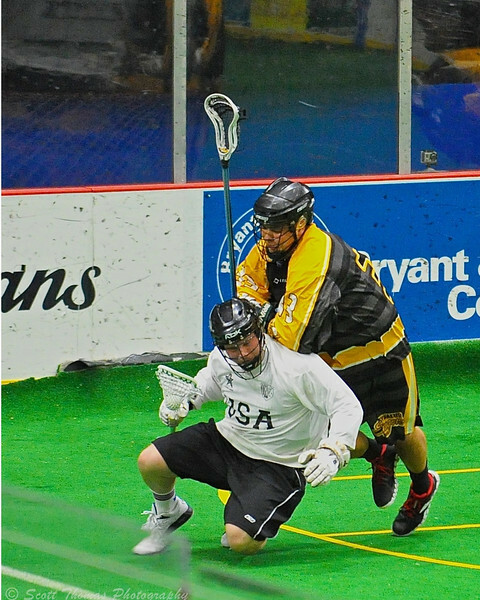 The game featured what makes box lacrosse the fastest game on two legs: speed, skill, and hard hitting action. Syracuse Stingers JR Bucktooth (33) checks a NYC Lax All-Stars player at the Onondaga County War Memorial in Syracuse, New York on Thursday, February 21, 2013. Nikon D700/70-200VR, 1/640s, f/2.8, ISO 5000, EV +0.6, 200mm focal length, cropped. After the game, the players shook hands and posed for photos. Time will tell if the game helped to sell the game for a possible franchise in a pro league. With Central New York being a hot bed for box and field lacrosse, the future looks good for one. 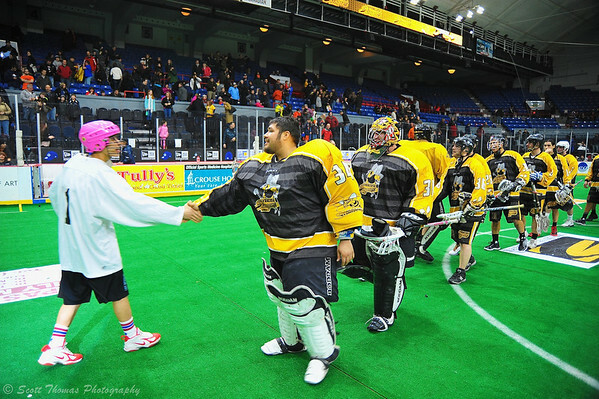 Syracuse Stingers goalie Spencer Lyons (34) leads his team in shaking hands with their opponent the NYC Lax All-Stars at the Onondaga County War Memorial in Syracuse, New York on Thursday, February 21, 2013. Stingers won the game, 19-8. Nikon D700/24-85G, 1/125s, f/3.5, ISO 1400, EV 0.6, 24mm focal length. 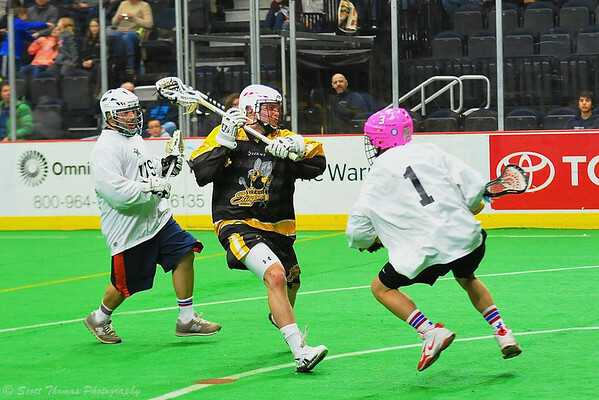 This entry was posted in Sports and tagged 70-200mm, ball, box lacrosse, exhibition, fast, game, green, helmets, new york, nikon D700, onondaga county, players, pro, professional, sticks, stingers, syracuse, turf, vr, war memorial. Bookmark the permalink. I would be so interested in seeing this sport of hurling. Got any examples? but do a youtube search, there’s plenty of vids up there!